Traditionally it has been a tad awkward to create a metric that gave you a daily average in Adobe Analytics. 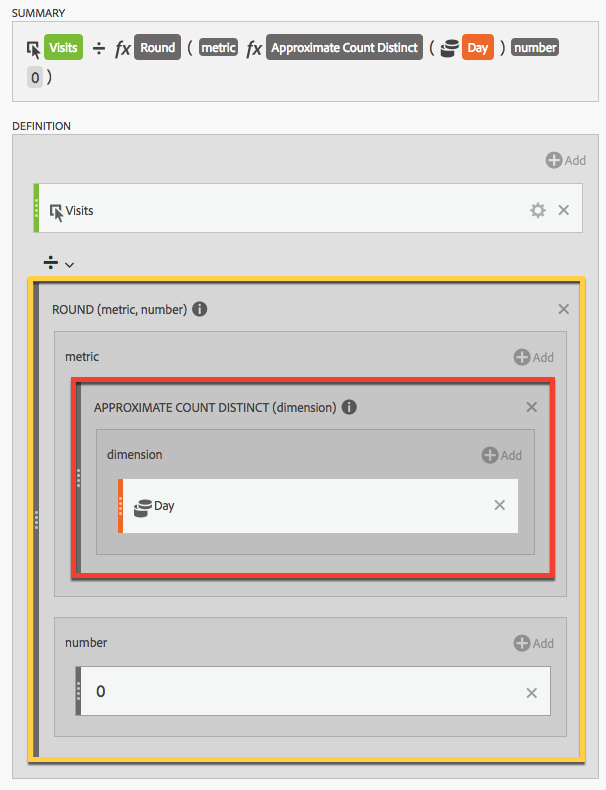 You either had to create a metric that could only be used with a certain time frame (with a fixed number of days), or create the metric in Report Builder using Excel functions. Thankfully, with today’s modern technology we are better equipped to do basic math ;). This is still a bit awkward, but should be easy for advanced users to create a metric that others can easily pull into their reports. The most important part of this is the red section which is the APPROXIMATE COUNT DISTINCT function. This asks for a dimension as the only argument into which you would plug the “Day” dimension. Now what’s up with the ROUND function in yellow around that? Well, as the name indicates, the distinctness of the count is approximate and doesn’t necessarily return a whole number like you would expect. To help it out a bit I just use the ROUND function to ensure that it is a round number. From what I have seen so far this is good enough to make the calculation accurate. However, if it is off by more than .5 this could cause problems, so keep an eye open for that and let me know if this happens to you. You can also use a variation of this to give you averages for just the weekday or weekend. This can be especially useful if your company experiences dramatic shifts in traffic on the weekend, and you don’t want the usual weekly trend to throw off your comparisons. For example, if I’m looking at a particular Saturday and I want to know how that compares to the average, it may not make sense to compare to the average across all days. If the weekday days are really high then they would push the average up and the Saturday I’m looking at will always seem low. You could also do the same for certain days of the week if you had the need. To do this we need to add just a smidge bit more to the metric. In this example, notice that the calculation is essentially the same. I have just wrapped it all in a “Weekend Hits” segment. The segment is created using a hits container where the “Weekday/Weekend” dimension is equal to “Weekend”. With the metric created just add it to your report. 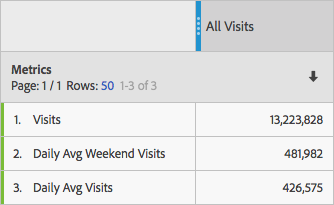 Now you can have the average weekend visits right next to the daily average and your total. You have now given birth to a beautiful little metric family. Congratulations! Keep in mind that this will count the days where you have data. This means your denominator could be deflated if you use this to look at a site, dimension, segment or combination that doesn’t get data every day. 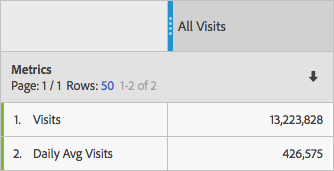 For example, let’s say you want to look at the daily average visits to a page that gets a tiny amount of traffic. If over 30 days it just has traffic for 28 of those days then this approach will just give the average over 28 days. 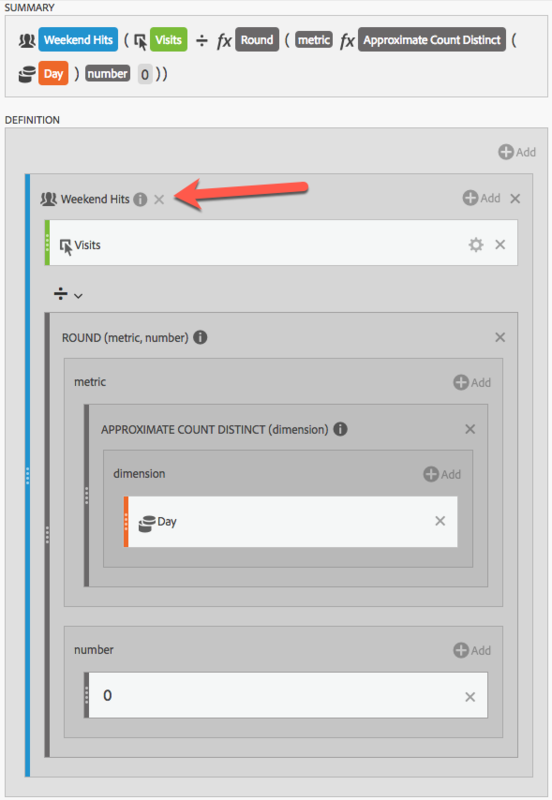 The reason for this is that the function is counting the line items in the day dimension for that item. If the day doesn’t have data it isn’t available for counting. In most cases this will likely help you. I say this mainly because date ranges in AA default to “This Month”. If you are in the middle of the current month, then using the total number of days in your time range would throw the calculations off. With this approach, if you are using “This Month” and you are just on the 10th then this approach will use 10 days in the calculation. Cool, eh?